There are so many ‘firsts’ when you’re recently separated that it can seem as though the difficulty is never ending. But the truth is that with each ‘first’ being overcome, you will be getting stronger and stronger. One particular ‘first’ that can take the recently separated by surprise with the intensity of sad feelings it brings is sending cards to people that you may not have seen for a while. 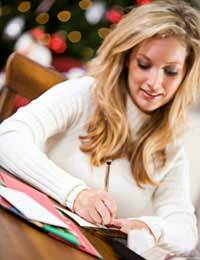 With the majority of close family and friends likely to already know about your separation, it is often sending Christmas cards to those people that you are not in regular contact with that needs addressing. People often have a number of old friends and acquaintances that are not a major part of their life, so it can be a number of months after separation that cards need to be sent, with Christmas being the most common time. Of course, you can choose not to send any at all, especially with the neat ecological reason easy to use. But this doesn’t address the fact that it can be quite a relief, and even empowering, to know that you are sending out cards in your own name. There are a number of issues that cause difficulty when sending out cards as a recently separated person. Should you go into detail? Should you just not mention the separation? Do you need to send them early as you now have a new address? Only you can know what the practicalities are, but many people who have experienced this say that the best way is to get cards sent out early so that any well-meaning calls or emails to talk about your situation are dealt with before Christmas itself brings its own emotional milestones. So what do you write? This may be one of the few times that a ‘round robin’ or general printed note is suitable. If you like, write a little note that gives your new address and a brief message (perhaps something like ‘after a tricky year I am now getting settled in my new life/new home’) and then just sign your name. Add an email address and your new address if you want to make it easy for people to contact you. Sending birthday cards and other cards can also be difficult when you’ve been used to being part of a pair. Using online e-cards can help to ‘disguise’ the change by introducing a new way of sending cards that is not in direct comparison with how you used to send cards, but you can also do this by sending a totally different style of card. It may be a comforting thought to realise that the people you are sending cards to will usually be thinking of themselves, as it is usually because of an event in their lives that you are sending a card anyway. If you’re thinking of sending cards out to people to tell them of your separation, unless you really want to this is rather unnecessary and can look a little bitter. If you have new contact details a simple new address card in just your name (and any dependants) will get the message across without you having to spell it out. my wife and i have recently seperated (not legal yet) to seperate residenceswe've endured cancer, heart attack(her) and job changes(both)and son through college(4yr) through out our 23 yrs of marriage while her2nd cancer diagnosisshe was having relationship with her co -worker (infidelity) once during last yr. i've always tried and been there to support her everydr. visit etc.now in last 4 months we've split residences . we were seperate during thanksgiving but now find myself torn between my wife and my sons thoughts on his mother needing to be together? and were to spend christmas? she wants to try and have all us together for a dinner? she wants to continue being a family? like nothing happened? i cant ! !or feel i can do that too many feelings on my end.whats your thoughts on what i should do ? and how do i respond to her invite?